It’s not so rare that a song accidentally becomes a hit, but it is rare that when that song does become a hit there is not act to perform it. 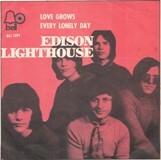 That was certainly the case with the first UK number one hit of the 1970s which was Love Grows (Where My Rosemary Goes) by Edison Lighthouse. Was it intentional or accidental? Let’s find out. Love Grows was written by Tony Macaulay and Barry Mason, both were experienced as Tony had composed Baby Now That I Found You, Back on My Feet Again and Build Me Up Buttercup for the Foundations as well as Let The Heartaches Begin and Mexico for Long John Baldry and Barry’s best known works are Here It Comes Again for the Fortunes, The Last Waltz and A Man Without Love for Engelbert Humperdinck, I’m Coming Home and Delilah for Tom Jones and the million-selling number one for Des O’Connor, I Pretend. They are often billed or remembered as a one hit wonder, but they did actually follow it up with the number 49 hit It’s Up to You Petula. They tried their luck one more time with a third single called Find Mr. Zebedee but it sprung out of sight. The song has appeared a handful of movies including the 2001 film Shallow Hal which starred Jack Black who falls for a large lady called Rosemary.